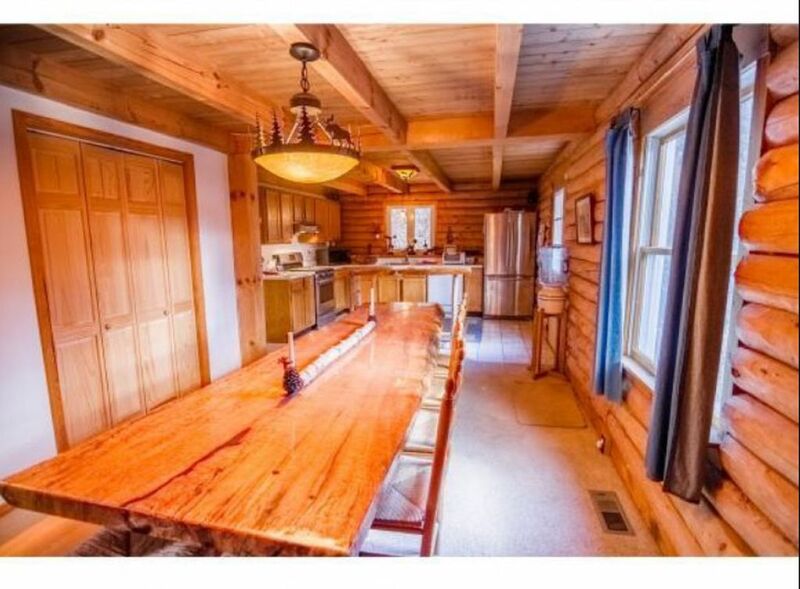 Unwind in this gorgeous large log ski home situated perfectly a few miles from both Okemo and Killington. This cozy home is a wonderful escape no matter what the season! Five bedrooms easily accommodate up to 16 people! Equipped with a beautiful dining table and kitchen, finished den space on the lower level, a wood stove, wifi, this home has the amenities! Finished basement includes darts, bumper pool, poker table, video game system, everything needed for a wonderful family fun. Minutes away from ski trails of Okemo and Killington, amazing hiking trails, vast snowmobile trails, fishing, Echo Lake, quaint shopping, antiquing, and much, much more!! Directly across the street from the Black River great fly fishing!!! It is a lovely house -- although I held my breathe when we pulled up. The inside is absolutely adoreable. The game room in the basement was awesome for the kids -- they had a blast down there playing cards and video games. The floors are paper-thin so you can hear everything on both floors -- could be a problem for anyone who has little ones that need to nap or ones that go to bed early. Having to take our garbage "home" or pay to drop it in a store's dumpster is inconvenient. Linens were not organized in each bedroom so I had to go through 5 bedrooms to find linens for all the beds -- some of the linens didn't have any elastic left. Michael was great checking in to make sure there were no issues. Rustic log cabin not ready for rentals...Dirty! Had to clean mice droppings everywhere upon arrival. Generally dirty. Two bathrooms but only one shower that leaks into the lower bathroom.. The jacuzzi tub does not work. Cabinet drawers and pan drawer are filthy with mice droppings. Driveway was ploughed at arrival but not again with a foot of snow on a steep driveway. Plastic shovel shattered when used. We had such a great time at this house. It was spacious with a well stocked kitchen, huge kitchen table for the crew we had. Killington was easily accessible from the house. Would definitely stay here again. The house inside is very beautiful and comfortable, outside needs some work though. Definitely recommend some railing for the front deck. Absolutely love the long dinning table, brings everybody together. Plenty of room and comfortable beds. Owner Michael is very nice, knows everything and answered all my questions. He told me that they are just get started at renting this home out and learning the ropes of managing vacation rentals. I believe he will soon turn this house into a wonderful get away in Vermont.